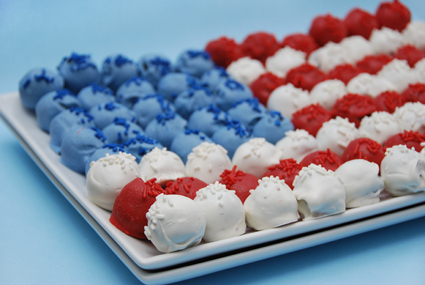 I had seen a cake ball flag for sale from a bakery a while ago and knew it was just a matter of time before I would see one of these beauties online. Katie got a bunch of her friends together and they made all sorts of fun 4th of July cake pops and truffles, including this fun cake truffle cake. You can get some tips on making your own cake pops and see the rest of their creations over at My Juice Cup. Be warned, the post may cause an increased desire to invite friends over to make cake pops. Ummm... YUM! Thanks so much for sharing! I'm adding this to my "To Bake" list. It looks amazing! I definitely want to have friends over and bake a MILLION cake balls. Now this is an awesome idea! I have made cake balls for family and friends and they are always asking for directions on how to make them. One of these day I going to post a tutorial on how I do even though there are a million out there already, the people I know don't cruise around blog land! after making teddy bear cake pops for my niece's birthday party today, I swore I was not going to make cake pops/balls for quite a while... but we are having a 4th of July celebration next week... hmmmmmm.